Julia Child, mother of all things culinary, implied that Italian cooking wasn’t really cooking. She couldn’t understand how tossing a few basic ingredients together in a pot (or oven) is actually cooking…I love ya Julia, but I think you may have missed out on some sensational simple sustenance. What I love about Italian cooking is just that, its simplicity, that simplicity is somehow comforting. 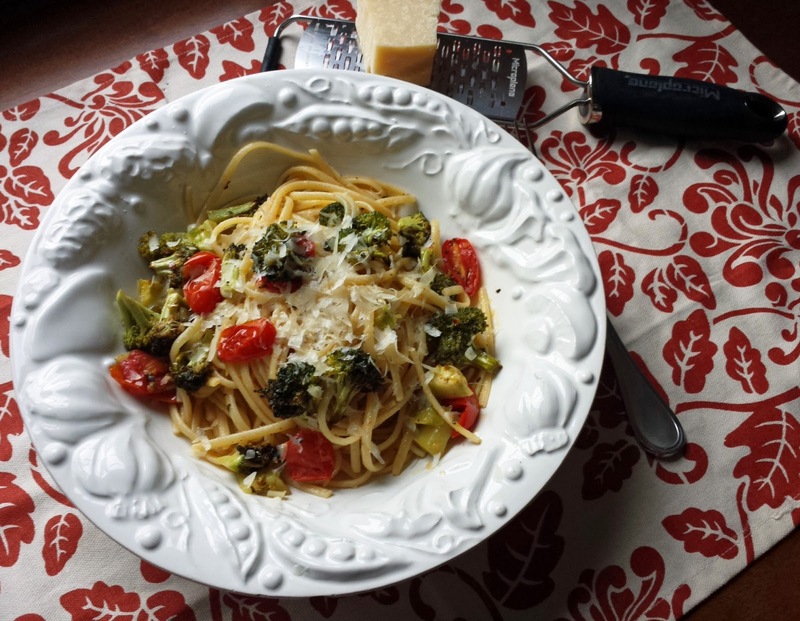 Italian’s also don’t waste anything in the kitchen, and it’s often these thrown together with scraps from the refrigerator dishes that are the most delectable! 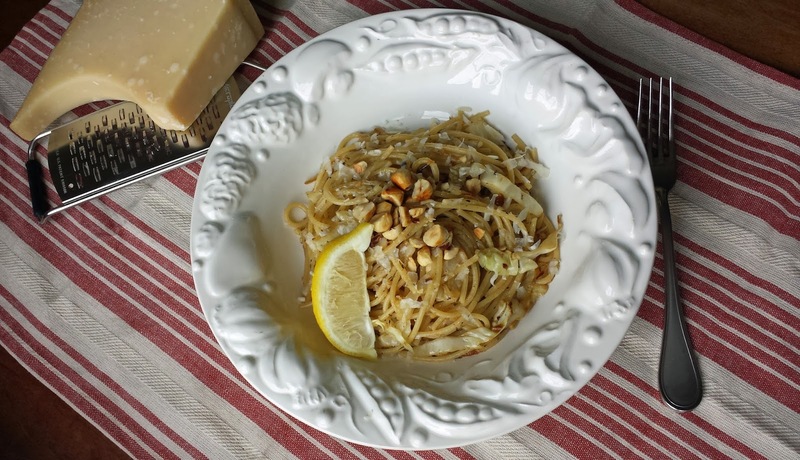 Spaghetti with Cabbage and Hazelnuts is one of those comforting, delectable thrown together dishes; it came about as a way to use up what I had in my refrigerator, and ended up being a new favorite meal! This dish is simple and uses only a few ingredients so it goes together super quick. 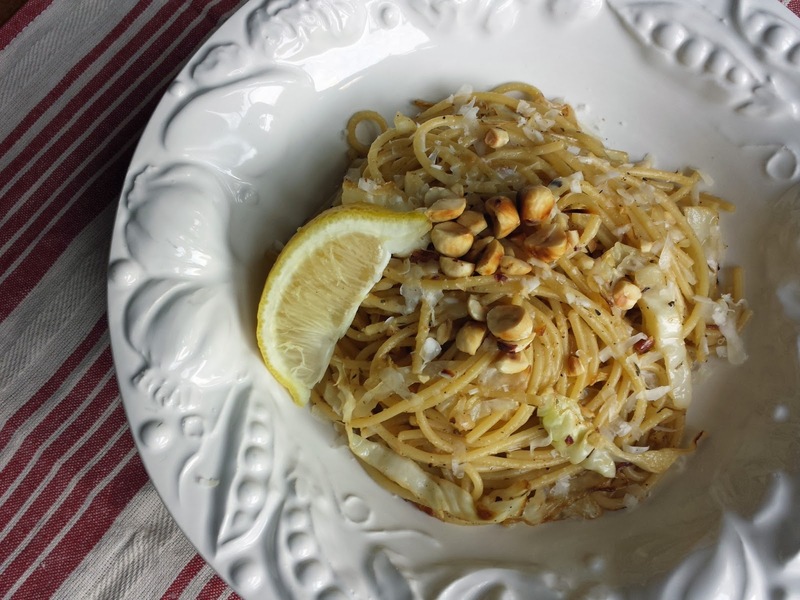 While I enjoy Spaghetti with Cabbage and Hazelnuts as a meal on its own, it would also be a great side dish to serve with pork or roasted chicken; you could even add some crumbled sweet Italian sausage or crisp pancetta just to change things up. Put the pasta water on to boil while the remaining ingredients are being prepped. Toast some hazelnuts in a hot skillet, keeping a close eye on them so that they don't burn. If the hazelnuts have the skins on them go ahead and put them into a paper towel, and rub them together, the skins will come right off. Chop them quite fine and put them to the side. The main ingredients; shredded cabbage, thinly sliced onion and minced garlic. Put the spaghetti on to cook in boiling salted water; cook it for 2 minutes less than the package directions state. Drain the cooked spaghetti but reserve 1/2 cup of that pasta water. While the spaghetti is cooking; over medium-high heat saute the cabbage and onions in a table spoon of olive oil and 1/2 tablespoon of butter. Also add 1/2 teaspoon of fresh or dried thyme and a pinch of salt and pepper. After about 5 minutes the cabbage and onions will begin to brown, add the garlic and cook until all the vegetables are tender. Stir in the juice of half of a lemon. Add the cooked spaghetti, 1/4 cup of the reserved pasta water, a touch more of olive oil, and salt and pepper to taste. Also toss in the toasted hazelnuts and cook until the pasta is al dente, adding more of the reserved pasta water if necessary. Serve with some grated Parmesan cheese. 1. Cook the spaghetti in boiling salted water for about 2 minutes less than the package directions state. Drain the cooked pasta, but reserve ½ cup of the pasta water. Put both to the side. 2. Meanwhile; toast the hazelnuts, in a large skillet over medium high heat, stirring quite often to keep the nuts from burning. When the hazelnuts are golden in color remove them from the heat. If the hazelnuts have skins on them, pour them into a paper towel, close up the paper towel and rub them together until the skins come off; discard the skins. Chop them quite finely, and put the hazelnuts to the side. 3. In the same skillet sauté the cabbage and onions in 1 Tbsp. of the olive oil and the butter over medium high heat stirring frequently. After about 5 minutes the cabbage and onions will begin to color, and then you can add the garlic, thyme, a pinch of salt & pepper. When the veggies are tender squeeze the juice of half of a lemon over them, give it a stir; and then toss in the cooked spaghetti adding ¼ cup of the reserved pasta water, the remaining ½ tablespoon of olive oil, the chopped hazelnuts, as well as salt & pepper to taste. Continue to cook and stir until the pasta is al dente, adding more of the pasta water if needed. Remove to serving dishes and top with grated parmesan cheese. Looks totally satisfying to me. I've seen a similar dish with pine nuts - love it!